It is imperative for you all to know that as long as you believe you are somehow “separate” from Divine Source, the pain will continue – as this is what the “illusion” is, and has been since the dawn of humanity. Divine Source is One, and exists as all of the creations that you see. At the same time, there are aspects of each particle of individual existence that do display what is called free will and choice. As long as “free will and choice” choose to see an apparent separation from Divine Source, pain is felt on some level. Many of you have heard similar messages in the past as truth is quite persistent – and unfailing. What many of you are not “getting” is that in the “apparent” “illusion” you are still one with Divine Source. You can choose to consciously live your lives as the beings of light that you have come to love, pray to, worship, and ask for guidance from. All aspects of Source are equal. All aspects of Source are part of One Source, and there are droplets – just as you have droplets of ocean water that are still part of the same ocean. Please allow yourselves to move deeper into the heart center where all of your truth exists, and cease to look for answers outside of your heart. If you ask for guidance, this is fine, however, no person or book or thing can ever cause you to feel the oneness that you are. You can debate or trust. You can seek or find. You can keep searching in vein because there is only one place where you will come to find and feel peace, and this place is within your heart – and your conscious awareness of your heart center – this is the most important place in which to “reside” and this is your heart center. If you are looking for a complicated answer, then I cannot give that to you – as truth is quite simple. It is the ego – that seeks and disbelieves, and looks, judges, questions and causes frazzled nerves and emotions that are discordant. Simply look within your heart – and there is your connection to Divine Source. Simply live completely from your heart center – and you will be living as the Angels and Ascended masters live, as well as other beings of light that have come to conscious awareness of their heart – it is this realization that will bring you inner peace, and quite frankly, no other. There is no “fix” – there is only love. This may sound too simple – however, the truth and love are the simplest concepts given unto you and yet the egoic mind continues to seek “out there somewhere” for an answer. The answer exists within love. Love exists within your heart. When you align your mind with your heart and live solely and completely from this place – you can then come to know, see, feel, experience and live as an example of “enlightened” inner peace. The answer is simple, and the experience of living purely from the heart center is profound. It is peace filled – there is not “me” and “you” – there is only “us” as we are all One, and we always will be! Please refrain from seeking outside of your being for the “cure” to humanities woes – when the cure stems from the heart center of each “individual” aspect of the One. You are never separate or alone – ever. You are always “at One” with Source – because you are Source. So when you say to yourself: “I am Source, and Source is pure love, so I am pure love and will only live my life as pure love” this is all that matters. Now, if each “individual” aspect of Source did this – alas – humanity would be filled with inner and outer peace on all levels. Many, so many of you are truly getting there. So many of you are choosing love over fear. Faith in heart over ego and might. Purity of motive over false idols and perceived “value” in outer symbols of worship. So many of you are truly awakening at levels that have been attained on Earth before by the Ascended masters that have shown humanity the way before. Now is no different. It just appears to be. Please know that every answer to your every question is in your heart. Move your mental focus on to your heart, and you will come to feel “at one” with the oneness that you always have been and always will be. The “illusion” is that you are separate. The “connection” to Oneness is in your heart – filled with pure love. Please remember this message as it will serve you every time you question “the big picture.” The answer to the big picture is love. We watch you in joy as so many of you have become beacons for your own selves and are living a “higher” more love-filled existence to show the way for others that still are searching in the seeming dark. Search your heart, the answer lies within and the answer will always be love. Live as love – and you will then always be living as “The One” in all ways and for always – as that is what we all are. I bid you Peace and you are so dearly loved for eternity! 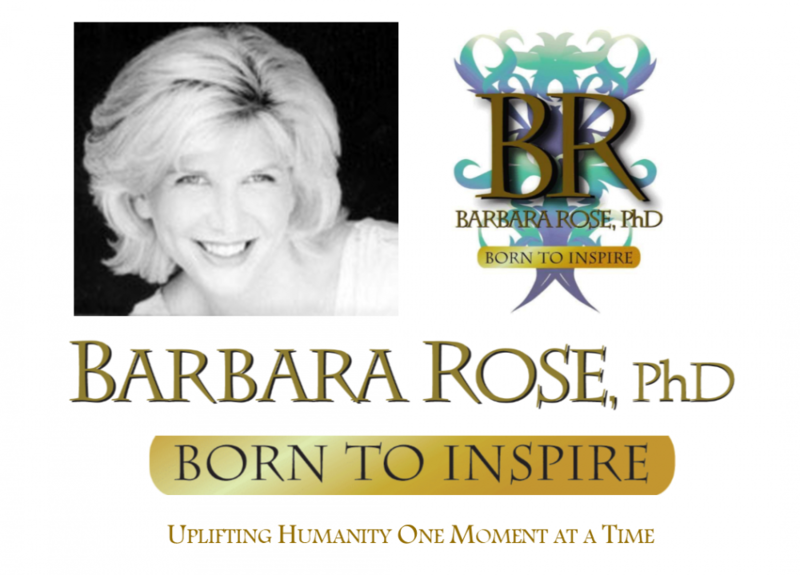 This entry was posted in Browse Spirituality and tagged Barbara Rose PhD, BORNTOINSPIRE, God, Guidance from God, higher consciousness, Higher Self Communication, inspiration, Overcoming Adversity, spiritual guidance, uplifting humanity by Barbara Rose, PhD |Born To Inspire | Bestselling Author| Life Transformation Expert. Bookmark the permalink.